It’s safe to say that director Ridley Scott hasn’t had the best luck with his films of late. From the tedious Prometheus to the disastrous Exodus: Gods and Kings, Scott has struggled to regain the brilliance and gravitas that his earlier works, including Alien and Blade Runner, added to the cinematic canon. Scott’s newest and anticipated film The Martian falls somewhere between: an exhilarating and engaging interplanetary journey that puts you at the edge of your seat, but also a predictable yarn without much character development and a simple narrative. Based on the novel by Andy Weir, The Martian centers on the team behind the Ares III mission to Mars. Lead by captain Melissa Lewis (Jessica Chastain), the crew faces a situation whereby a storm of rock and sand threaten their safety on the planet. 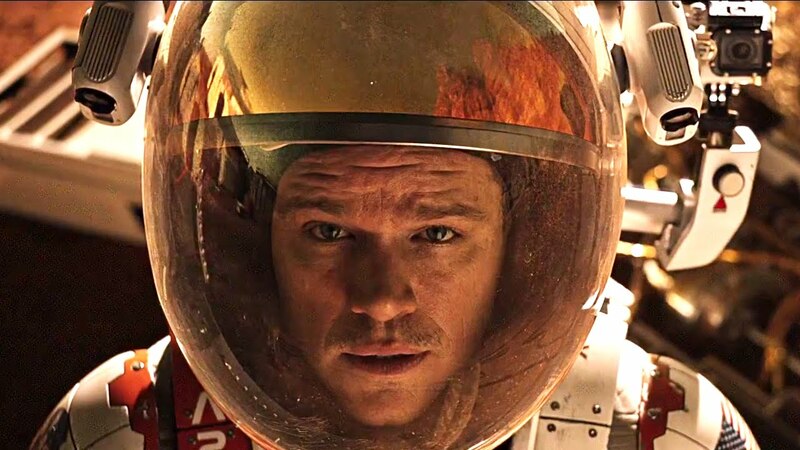 As the storm strikes the crew and their shuttle, one astronaut Mark Watney (Matt Damon) is swept away and presumed dead on the planet, while the others trek back home. But, as all films go, Watney is in fact not dead at all, but partially buried in Mars’ landscape, slowly losing oxygen. Motivated to stay alive, Watney decides to put his skills to use to create food, create water and learn how to last on an unlivable planet for another 4 years until the next mission leaves earth on it’s 11 month voyage to the red planet. And from here is where the story really begins. It’s an interesting film, supported greatly by scientific knowledge and investigations, and much of the film consists of Watney’s survival discoveries as he tries to survive on the planet. There are elements from Alfonso Cuaron’s Academy Award winning Gravity and from Christopher Nolan’s lackluster Interstellar, which also coincidentally starred Chastain and Damon, but The Martian is works as more of a cross between Cast Away and Moon – fascinating but simplistic. Damon is excellent in his portrayal as Watney and carries the film as its sole character for much of the story. Between talking to himself and trying to keep himself alive, he continue to engage the audience, wins our sympathy and puts us there with him. Indeed, the role could’ve gone to another breakthrough actor as a fantastic vehicle to display their talent, rather than Damon who was Scott’s obvious choice and is predictably good, but alas Scott sticks with the traditional elements of a famous lead actor, star cast and incredible special effects, music score cinematography that is sure to please viewers. The rest of the ensemble is also good, but most of the cast appear to be just name droppers for the film marketing. Chiwetel Ejiofor, Jeff Daniels and Michael Pena are all strong in their roles, but the likes of Kristen Wiig, Sean Bean and Kate Mara are underused and aren’t memorable in the spectacle of the film. It’s a shame, but also worthy to remember that this film is fundamentally only about Damon, meaning an ensemble cast add very little to the content of the film overall. As noted, much of the film explains the technicalities and scientific specifications for Watney to stay alive, remaining true to the novels attention to detail on how he stays alive. It’s also made funny through clever writing and the scenes are more interesting than they would if explained in a science classroom. Much of the storytelling is excellent and Scott really deserves praise for bringing the script to the screen and keeping it fast paced, informative and interesting. Moreover the film is great because it is high impact, pleasing entertainment without lacking intrigue or intense concentration. Of course there is little character development and some moment lag, but ultimately it works because of Damon at the helm and Scott bringing the novel to life. The story of fighting against impossible odds alone on an entire planet deliver thrills and chills throughout. But it isn’t all planet exploration – it’s a character profile of a character who is one of the most human and real in recent blockbuster memory. Originally published on CelebrityOz, October 7, 2015.